Look down at your fingers for a second, then look back up here. Chances are you’re still using the same cheap plastic keyboard that came with your PC, and that’s a pity. The keyboard is your primary tool, the unsung workhorse of your day. Without it, you couldn’t get anything done—but I’ll bet you haven’t spent 5 minutes thinking about how you could improve your typing experience. If you’re willing to pay for premium PC hardware, finding the perfect keyboard can be worth the investment in time and cash. Keyboard manufacturers have been refining their craft since IBM made the first Model M, and today the market is chock-full of premium hardware. The only trick is figuring out which model is just right for your particular needs. The first decision you have to make is whether to stick with a wired keyboard. Choosing a wireless keyboard is an easy way to start clearing a cluttered desk, but it has plenty of downsides, too. Lacking a wire to transfer power, wireless keyboards require regular recharging. If you’re the type of person who forgets to charge your phone every night, a wireless keyboard probably isn’t a good match for you. The Logitech diNovo Edge is a Bluetooth keyboard with scissor switches. Another issue with wireless keyboards is the choice between radio-frequency (RF) and Bluetooth connectivity. Bluetooth keyboards—like Logitech’s diNovo Edge—usually require more power than their RF counterparts, but they don’t require a dedicated USB dongle slotted into your PC. Unfortunately, some cheaper Bluetooth keyboards can have trouble waking up from sleep or remaining paired with your computer. If you prefer to stick with the more reliable radio-frequency option, be aware that most RF wireless keyboards operate on the 2.4GHz frequency, which makes them susceptible to interference from nearby devices (such as cordless phones and microwave ovens) that use the same frequency. All wireless keyboards—whether Bluetooth or RF—are subject to interference. Random key presses and occasional disconnects can happen. If you’re looking for a completely reliable plug-and-play experience, stick with a wired keyboard. The switches in your keyboard—the little mechanisms in each key that tell the keyboard when you’ve pressed them—have a huge effect on your typing experience. Chances are, the keyboard you’re using right now sports rubber-dome switches, which work by pushing a rubber dome onto your keyboard’s printed circuit board to activate the associated key. Most manufacturers use rubber-dome switches because they’re cheap. Unfortunately, rubber-dome keyboards don’t offer any tactile feedback until a keystroke bottoms out by striking the plastic housing of the key against bottom of the keyboard. This action is neither ergonomic nor enjoyable. Scissor switches resemble rubber-dome switches, but with a slimmer profile, which explains their popularity with manufacturers of laptop keyboards and slim keyboards like Apple’s aluminum keyboard. Scissor switches feel remarkably similar to rubber-dome switches, except that their shorter key travel—the distance from resting to bottoming out on the board—makes them even less comfortable to type on for prolonged periods. Cooler Master’s CM Storm QuickFire line of mechanical keyboards includes the Rapid, available with Black, Red, Brown, or Blue switches. Cherry MX mechanical switches, the most popular alternative to rubber-dome and scissor keyboards, are built into 95 percent of the mechanical keyboards on the market. Though Cherry MX mechanical switches have longer key travel than rubber-dome or scissor switches, their actuation—when the computer registers your key press—happens before you press the key all the way down. This faster feedback helps avoid the common behavior of bottoming out with every keystroke, thereby saving unnecessary time and effort. The different color-coded models of Cherry MX mechanical switches offer different levels of tactile feedback and resistance. The types you need to know about are the four most popular ones: Brown, Blue, Black, and Red. The tactile feedback that Blue and Brown switches offer is essential for swift, pain-free typing. Brown switches are the most popular because they’re fairly easy to press and have a slight tactile bump at the actuation point. If you’re paying attention, you can feel when the key is activated, but that mechanical action won’t impede your typing. Another benefit: A mechanical keyboard equipped with Brown switches doesn’t make much more noise than a standard membrane keyboard. Blue switches make an audible—and tactile—click when the switch actuates. Since they offer a little more resistance than Brown switches, Blue switches are ideal for mechanical keyboard newbies. The loud click helps train the user to to press each key with just enough force to actuate the switch without bashing it into the bottom of the keyboard. Red and Black switches are outliers that don’t provide any tactile feedback when the switch actuates. Instead, they’re built to offer linear resistance that increases as you press the key. Red switches offer slightly less resistance than their Black counterparts. Keyboards with these switches are designed for gamers who regularly hold down multiple keys and like to bottom out with each key press to ensure that they don’t accidentally mistype a command. For a work keyboard, you’ll probably want to stay away from anything with loud Cherry MX Blue switches. And if you prefer a keyboard that feels crisp and responsive when you type, avoid Cherry MX Red and Black switches. Keyboards don’t have to come in a QWERTY layout, with a numeric keypad on the side. Numpad-free keyboards are available, and some boards even let you switch from QWERTY layout to Dvorak or Colemak, and back again. The most common keyboard configuration consists of a 104-key layout with a full set of QWERTY keys and a ten-key numeric keypad. They’re extremely common in North America, and you can often find them in hotels and public areas around the world—even in regions that generally don’t use the QWERTY layout (like France) or the English alphabet (like Japan). Many versions come with added media keys and other extra features. Keyboards without the ten-key numeric keypad (compactly known as tenkeyless keyboards) are becoming more and more popular because they tend to be smaller, lighter, and a bit cheaper than standard 104-key keyboards. The absence of a numeric keypad—as on Truly Ergonomic’s Truly Ergonomic Keyboard and Cooler Master’s CM Storm QuickFire Rapid—also leaves more room next to the keyboard for the mouse—a huge bonus for gamers. The Truly Ergonomic Keyboard has a split design with Cherry MX brown switches. Spending any amount of time on your computer can tax your body to a surprising extent, so the perfect keyboard should make typing as painless as possible. Even if you’re committed to using mechanical switches, take the time to find a mechanical keyboard whose ergonomic layout feels good beneath your wrists. Testing these keyboards can be tough—you probably won’t find the Das Keyboard Professional Model S on display in your local Best Buy—but with luck, you may find some friends or coworkers who will let you bang out a few sentences on their keyboards to see how they feel beneath your fingertips. If no such opportunities present themselves, take time to read keyboard reviews—and keep an eye peeled for comments about wrist strain or finger fatigue. Most ergonomic keyboards feature a split layout that physically separates the keys you press with one hand from those you press with the other. Keyboards like the Kinesis Freestyle 2 consist of two distinct pieces that you can arrange for maximum comfort. Others, like the Goldtouch V2 Adjustable Comfort Keyboard, are hinged and have built-in support for vertical tenting (raising the center of the keyboard). The Kinesis Advantage USB may look odd, but your hands and wrists may benefit from its ergonomic layout during marathon typing sessions. A few ergonomic keyboards—the Kinesis Advantage USB among them—go further and alter aspects of the standard keyboard layout. Though the QWERTY layout of the alphabetic keys remains intact, the keys are spaced at different elevations in rows that aren’t perfectly aligned. The lack of straight lines looks a little weird at first, but your hands aren’t built to be perfectly straight, either. Almost all ergonomic keyboards require some sort of a learning curve before you can get up to your normal typing speed. They’re not for everyone, but if you’ve suffered any sort of wrist or finger pain from working on a standard keyboard, they’re worth considering seriously. Celluon’s Epic is one of the few projection keyboards available. Though they're not ideal for everyday use, having a pocket-friendly keyboard is undeniably attractive. 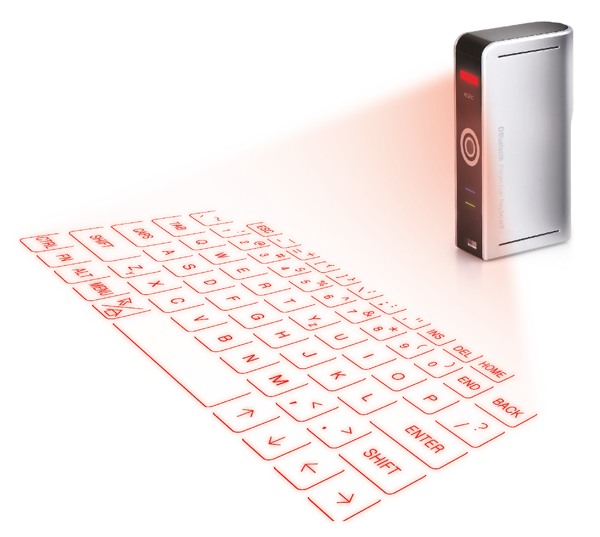 Projection keyboards haven’t garnered much mainstream appeal, but they’re a viable option to traditional keyboards. Products like the Celluon Epic (which can easily fit in a pocket) are for people who seek portability above all else. 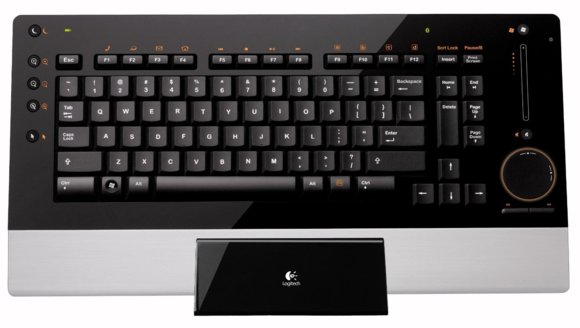 When activated, the Epic projects a full-size, infrared keyboard onto any flat surface. Typing on an infrared keyboard feels about as comfortable as typing on a hard, flat surface—no surprise there—and it doesn’t hold a candle to the experience of typing on an actual keyboard, but it can help you get up and typing in a pinch. No matter which keyboard you decide to buy at the end of your research, using it will almost certainly be a better experience than continuing to mash away on the keys of whatever cheap plastic slab came with your computer.